"We are in power. Nobody will deny it. By virtue of that power we shall remain in power...We have no words to waste on you. When you reach out your vaunted strong hands for our palaces and purpled ease, we will show you what strength is. In roar of shell and shrapnel and in whine of machine-guns will our answer be couched. We will grind you revolutionists down under our heel, and we shall walk upon your faces. The world is ours, we are its lords, and ours it shall remain. As for the host of labor, it has been in the dirt since history began, and I read history aright. And in the dirt it shall remain so long as I and mine and those that come after us have the power. There is the word. It is the king of words--Power. Not God, not Mammon, but Power. Pour it over your tongue till it tingles with it. Power." Jack London didn't just write tales of the Klondike Gold Rush and canine adventure stories. Sometimes he foretold the future. The above quote, written over a century ago and spoken by an aristocratic one-percenter in response to the rising tide of anti-plutocratic sentiment among the working class, is taken from London's dystopic novel, The Iron Heel. The novel depicts a society of unregulated and unrestrained capitalism; a society of the impoverished and disenfranchised, the unemployed and the unrepresented, at the mercy of a tiny but ruthlessly aggressive corporate elite that controls the government. London describes the perception of "the great mass of the people [who] still persisted in the belief that they ruled the country by virtue of their ballots," when "[i]n reality, the country was ruled by what were called political machines. At first the machine bosses charged the master capitalists extortionate tolls for legislation; but in a short time the master capitalists found it cheaper to own the political machines themselves and to hire the machine bosses." Furthermore, London delves into the deluded arrogance of the wealthy, stock-holding plutocrats, explaining, "They believed absolutely that their conduct was right. There was no question about it, no discussion. They were convinced that they were the saviours of society, and that it was they who made happiness for the many. And they drew pathetic pictures of what would be the sufferings of the working class were it not for the employment that they, and they alone, by their wisdom, provided for it." Later, he reiterates that "[t]he great driving force of the oligarchs is the belief that they are doing right. Never mind the exceptions, and never mind the oppression and injustice in which the Iron Heel was conceived. All is granted. The point is that the strength of the Oligarchy today lies in its satisfied conception of its own righteousness." Clearly anticipating the recent talk of how important and benevolent "job-creators" are and how more equitable taxation policies would "punish success," London explains, "Out of the ethical incoherency and inconsistency of capitalism, the oligarchs emerged with a new ethics, coherent and definite, sharp and severe as steel, the most absurd and unscientific and at the same time the most potent ever possessed by any tyrant class." At one point, London defines a political lobby as "a peculiar institution for bribing, bulldozing, and corrupting the legislators who were supposed to represent the people's interests" and excoriates journalists for their willingness, due to the fear of losing their jobs, "to twist truth at the command of [their] employers, who, in turn, obey the behests of the corporations." At one point, the "press in the United States" is described as "a parasitic growth that battens on the capitalist class. Its function is to serve the established by moulding public opinion, and right well it serves it." Likewise, London writes that Wall Street, "where was situated the stock exchange, and where the irrational organization of society permitted underhanded manipulation of all the industries of the country," deliberately "turned the stock market into a maelstrom where the values of all the land crumbled away almost to nothingness." Despite this economic turmoil, criminality and injustice, the Oligarchy remains terrifyingly "imperturbable, indifferent, and sure" in its "serenity and certitude." London foresees what we have recently witnessed: "Not only did it use its own vast power, but it used all the power of the United States Treasury to carry out its plans," later writing that "capture of the world-market by the United States had disrupted the rest of the world." "No other conclusion is possible than that the capitalist class has mismanaged, that you have mismanaged, my masters, that you have criminally and selfishly mismanaged...You have failed in your management. You have made a shambles of civilization. You have been blind and greedy." "You have no souls to be influenced. You are spineless, flaccid things. You pompously call yourselves Republicans and Democrats. There is no Republican Party. There is no Democratic Party. There are no Republicans nor Democrats in this House. You are lick-spittlers and panderers, the creatures of the Plutocracy. You talk verbosely in antiquated terminology of your love of liberty, and all the while you wear the scarlet livery of the Iron Heel." Jack London's The Iron Heel preceded Aldous Huxley's Brave New World and Sinclair Lewis' It Can't Happen Here by about two and a half decades and George Orwell's 1984 by over 40 years. It anticipated the rise of totalitarianism in Europe over a decade before Mussolini's Blackshirts marched on Rome. In his Introduction to the 1980 edition of the book, Rutgers professor H. Bruce Franklin explains that London essentially defined Fascism before it even officially existed as "the form that the capitalist state assumes when the oligarchy feels that its economic and political power is seriously threatened by working class revolution." London foresees: the creation of attractive suburbs for the relatively privileged strata of the working class while the central cities are turned into what he calls "ghettoes" for the masses of unemployed and menial laborers, shoved into the darkest depths of human misery; the deliberate economic subversion of public education in order to spread illiteracy and ignorance; adequate food, health care, and housing priced above the reach of more and more people; the ubiquitous secret police infiltrating all organizations opposing the government; the establishment of a permanent mercenary army; the government conspiring in real and phony bomb plots, in the suppression of books and the destruction of printing presses, in witch hunts aimed at dissident labor leaders, professors, and authors, in destroying the reputations of some of its opponents, imprisoning many others and murdering the few it finds too formidable; spontaneous mass rebellions of the downtrodden people of the central cities; urban guerrillas battling the government's army of mercenaries and police in the canyons of the cities. Clearly, from historic income inequality and over 15% of Americans living in poverty (that's 46.2 million people) to massive budget cuts for public education to FBI infiltration of peace groups to the ever-expanding surveillance state to the stifling of free speech to spooky terrorist plots allegedly thwarted by the very agencies that planned and funded them in the first place, Jack London was on to something. To say the least. The Occupy Wall Street movement around the globe is a testament to our new reality, as presaged by one of our renowned writers. The Iron Heel is set primarily in California's Bay Area, London's home turf. 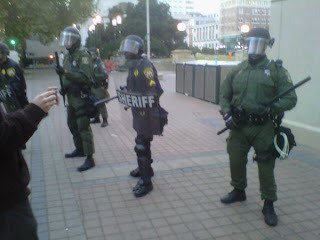 Yesterday morning, Tuesday October 25, 2012, the non-violent, anti-corporatist protesters occupying two parks in Oakland met their own city's iron heel, jackboots in full riot-gear. 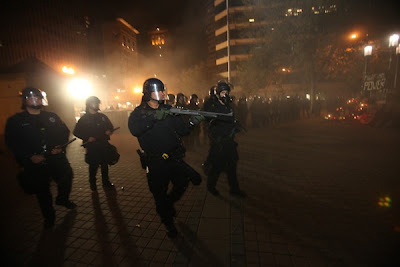 The Atlanta Journal-Constitution reported, "Under cover of darkness early Tuesday, hundreds of police swept into Oakland's Occupy Wall Street protest, firing tear gas and beanbag rounds before clearing out an encampment that demonstrators had hoped would stir a revolution," continuing, "Officers and sheriff's deputies from across the San Francisco Bay area surrounded the plaza in front of City Hall at around 5 a.m. and closed in. Eighty-five people were arrested, mostly on suspicion of misdemeanor unlawful assembly and illegal camping, police said." Reflecting on the raid and arrests which were carried out at the behest of Oakland mayor Jean Quan, interim Police Chief Howard Jordan said, "I'm very pleased with the way things went." In response, thousands of protesters gathered later that same day and faced down a phalanx of Oakland's Finest Fascist, who responded by repeatedly attacking the crowd with more tear gas, batons, rubber bullets, beanbags, concussion grenades, flashbombs, and sound cannons. At one point, Oakland authorities, claiming the protest was "an unlawful assembly," issued this threat: "If you refuse to move now, you will be arrested. If you refuse to move now, chemical agents will be used" (see here) and later warned those peacefully standing their ground, "If you have respiratory problems now is the time to leave." They weren't kidding. "The Plutocracy has all power in its hands today. It today makes the laws, for it owns the Senate, Congress, the courts, and the state legislatures. And not only that. Behind law must be force to execute the law. Today the Plutocracy makes the law, and to enforce the law it has at its beck and call the police..."
Meanwhile, as gas clouds wafted through the Oakland air, just across the bay in San Francisco, President Barack Obama was at a reelection fundraiser at the W Hotel for which guests shelled out at least $5,000 to attend. It was the latest stop on one of the president's "busiest donor outreach trips of the season." Last week, the Washington Post reported that "despite frosty relations with the titans of Wall Street, President Obama has still managed to raise far more money this year from the financial and banking sector than Mitt Romney or any other Republican presidential candidate." It remains to be seen whether Obama addresses the police brutality and stifling of dissent that occurred just a few miles from where he dined with his donors, especially in light of what he had to say about the post-election protests and police response in Iran in mid-2009: "We call on the Iranian government to stop all violent and unjust actions against its own people." Earlier this year, Obama recalled what he termed the "peaceful protests...in the streets of Tehran, where the government brutalized women and men, and threw innocent people into jail." In the speech he delivered upon accepting the Nobel Peace Prize in Oslo, Obama noted his apparent belief that "peace is unstable where citizens are denied the right to speak freely" or "assemble without fear." He affirmed his support of "the hundreds of thousands who have marched silently through the streets of Iran," continuing, "It is telling that the leaders of these governments fear the aspirations of their own people more than the power of any other nation. And it is the responsibility of all free people and free nations to make clear to these movements that hope and history are on their side." Just last month, in front of the United Nations General Assembly, the president stated, "The Syrian people have shown dignity and courage in their pursuit of justice — protesting peacefully, standing silently in the streets, dying for the same values that this institution is supposed to stand for. And the question for us is clear: Will we stand with the Syrian people, or with their oppressors?" One can only wonder if Obama will heed the words he spoke at the UN in September 2009, when he told world leaders, "The test of our leadership will not be the degree to which we feed the fears and old hatreds of our people. True leadership will not be measured by the ability to muzzle dissent, or to intimidate and harass political opponents at home. The people of the world want change. They will not long tolerate those who are on the wrong side of history." Will the president remember what he said at the same podium a year later? "The arc of human progress has been shaped by individuals with the freedom to assemble and by organizations outside of government that insisted upon democratic change and by free media that held the powerful accountable," he declared. "We know, and well we know by bitter experience, that no appeal for the right, for justice, for humanity, can ever touch you. Your hearts are hard as your heels with which you tread upon the faces of the poor. So we have preached power. By the power of our ballots on election day will we take your government away from you." With the Occupy movement growing stronger, more determined, fearless and united with every tear gas canister launched and each protester beaten, pepper sprayed, and arrested, it is surely a movement that can no longer be silenced or suppressed. "The solidarity of labor is assured, and for the first time will there be an international revolution wide as the world is wide." UPDATE: On October 26, Bloomberg News reported on a dazzlingly self-unaware and absurd statement made by Bank of America Corp. Chief Executive Officer Brian T. Moynihan last week at "a global town hall meeting" with the bank's employees. "I, like you, get a little incensed when you think about how much good all of you do, whether it's volunteer hours, charitable giving we do, serving clients and customers well," Moynihan told the meeting, then addressing those protesting corporatocracy this way: "You ought to think a little about that before you start yelling at us." Among the "good" that Bank of America has done is not paying any federal taxes in the past two years, "eliminating more than 30,000 jobs" and raising banking fees in an effort to cut costs and increase revenue to "help reverse a stock decline this year of more than 50 percent," not to mention being "ranked lowest in a 24-bank survey of small business customer satisfaction from J.D. Power and Associates this month" and being "named the country's second-worst company by Consumerist.com after BP Plc, the firm blamed for the worst U.S. offshore oil spill." "I discovered that they had an ethic superior to that of the rest of society. It was what I may call the aristocratic ethic or the master ethic. They talked in large ways of policy, and they identified policy and right. And to me they talked in fatherly ways, patronizing my youth and inexperience. They were the most hopeless of all I had encountered in my quest. They believed absolutely that their conduct was right. There was no question about it, no discussion. They were convinced that they were the saviours of society, and that it was they who made happiness for the many. And they drew pathetic pictures of what would be the sufferings of the working class were it not for the employment that they, and they alone, by their wisdom, provided for it." London, in a footnote, also quotes British philosopher and economist John Stuart Mill from On Liberty: "Wherever there is an ascendant class, a large portion of the morality of the country emanates from its class interests, and its feelings of class superiority." The patronizing sense of superiority oozing from Brian Moynihan's statement couldn't prove London and Mill more correct if they had written it themselves. "Who controls the government today? The proletariat with its twenty millions engaged in occupations? Even you laugh at the idea. Does the middle class, with its eight million occupied members? No more than the proletariat. Who, then, controls the government? The Plutocracy, with its paltry quarter of a million of occupied members." 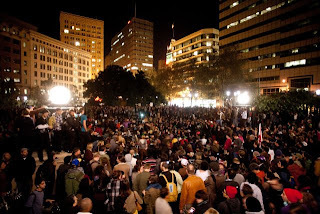 October 27, 2011 - The connections between Occupy Wall Street, Occupy Oakland in particular, and Jack London's prescient 1908 novel of popular, anti-capitalist revolution The Iron Heel continue to abound, and not just because Oakland, California is home to Jack London Square (currently, unoccupied). Last night, at the Occupy Oakland encampment outside City Hall, thousands of attendees voted nearly unanimously in favor of a city-wide general strike to begin on November 2, 2011 in response to the repression and aggression of the Oakland Police Department (and elsewhere) that left many injured and one Iraq veteran in critical condition. Erik Oster of The Faster Times reports, "Of the 1,607 people subject to the vote, 1,484 voted in favor of the resolution, only 46 against it. 77 people abstained from voting." The resolution, which has sent Oakland mayor Jean Quan into a spin-cycle, calls for "a city wide general strike and we propose to invite all students to walk out of school. Instead of workers going to work and students going to school, the people will converge on downtown Oakland to shut down the city. All banks and corporations should close down for the day or we will march on them." Not coincidentally, the last major strike in U.S. history also happened in Oakland when, in the fall of 1946, "[f]aced with the continuing resistance of Oakland's retail merchants to unionization at Hastings and Kahn's department stores in downtown Oakland, 400 clerks from those stores went out on strike in late October." In early December, the strike escalated when store management, backed by Oakland's city government and conservative business elite, enlisted the aid of police to clear away pickets and protect strike-breaking delivery trucks. American Federation of Labor unions throughout Alameda County voted to strike in solidarity with the clerks. On December 3, 1946, 100,000 workers from 142 AFL unions -- including workers from factories, industries, services, retail stores, transportation systems and more -- declared a "work holiday" and walked off their jobs. The General Strike lasted until city and labor leaders settled on a compromise agreement, returning workers to their jobs on Dec. 5. In the months that followed, the populist Oakland Voters League brought together progressive factions in the city to elect four out of five labor candidates to the city council. The upcoming Oakland strike has already initiated a call for a global strike in mid-May next year. Though the specific circumstances varied, Jack London had predicted the 1946 strike by four decades. Describing the dire state of affairs in the country - and the world - London wrote, "The stage was set for a world-catastrophe, for in all the world were hard times, labor troubles, perishing middle classes, armies of unemployed, clashes of economic interests in the world-market, and mutterings and rumblings of the socialist revolution." The goals of the war are made clear: to "consume many national surpluses, reduce the armies of unemployed that menaced all countries, and give the Oligarchy a breathing space in which to perfect its plans and carry them out. Such a war would virtually put the Oligarchy in possession of the world-market." Even the common laborers and all unorganized labor ceased work. The strike had tied everything up so that nobody could work. Besides, the women proved to be the strongest promoters of the strike. They set their faces against the war. They did not want their men to go forth to die. Then, also, the idea of the general strike caught the mood of the people. It struck their sense of humor. The idea was infectious. The children struck in all the schools, and such teachers as came, went home again from deserted class rooms. The general strike took the form of a great national picnic. And the idea of the solidarity of labor, so evidenced, appealed to the imagination of all. And, finally, there was no danger to be incurred by the colossal frolic. When everybody was guilty, how was anybody to be punished? London writes of a country "paralyzed" wherein "not a train ran, not a telegraphic message went over the wires, for the telegraphers and railroad men had ceased work along with the rest of the population" and where "no wagons rumbling on the streets, no factory whistles, no hum of electricity in the air, no passing of street cars, no cries of news-boys--nothing but persons who at rare intervals went by like furtive ghosts, themselves oppressed and made unreal by the silence." What London didn't predict (unsurprisingly) was the connectivity of instant communication and social media. He writes that, during the strike, "there were no newspapers, no letters, no dispatches" and that "[i]n San Francisco we did not know what was happening even across the bay in Oakland or Berkeley." This time around, in the fall of 2011 rather than a fictionalized 1912, the whole world is watching. Your writings are superb and so true. The apple here did not fall far from the tree. Great article, Nima. 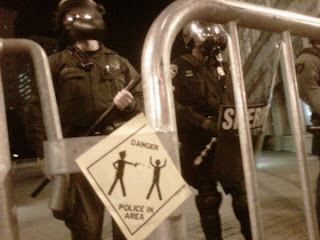 Hope to read your thoughts on the disappearing #OWS Palestine tweets. Also, so very sorry to bother you, but some months ago, you tweeted a video of scenes in Iran. I believe it was by someone named "Cyrus" but I could be way off. If it's not too much trouble, could you please give me the name of the video? I'd doing a short project on Iran's "nuclear weapons program" for college. Any help you could give me would be very much appreciated. Here's that beautiful 3-minute video of Iran by Cyrus Dowlatshahi: IRAN 2011. Also, I'm happy to help you out in any way possible with your project. Please feel free to email me. That's the one! Thank you so much!